Wadokai United Kingdom was formed and registered with Japan Wadokai in 1993 it consisted of groups belonging to Aiwakai from England and Wales. In 1995 Aiwakai joined the governing body for karate in England the English Karate Governing Body (EKGB), the Aiwakai groups belonging to Wales also joined the Welsh Karate Federation (WKF). England changed its name to Wadokai England but is still registered as Wadokai United Kingdom with Japan Wadokai. 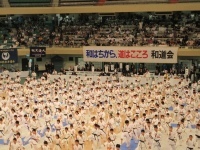 Wadokai England has also competed in the Japan Wadokai World Championships 1999, 2005, 2010 and the World Wadokai Cup held in Moscow, Russia in 2002. Our Members from around the world. For weeks after the tournament I found myself vividly recalling the moment the judges’ flags went up unanimously for England…..
England team that assembled at the Sports Village of Lignano Sabbiadoro in Italy for the 39th FEW European Championships. travelled to Lisbon with the hope of becoming the first ever Sakagami Cup Champions….